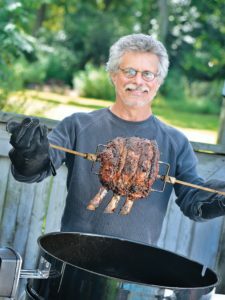 Rotisserie Prime Rib with Horseradish Cream is one of more than 100 recipes in my latest book, Project Fire (Workman, 2018), which will be released May 1. (Pre-order here.) The roast is generously studded with slivers of garlic and sprigs of fresh rosemary, decisively seasoned, then spit-roasted over a wood fire (you can use charcoal or gas, too) until the outside is crusty and the inside is a rosy medium-rare. And to accompany it, fiery Horseradish Cream, pungent with freshly-grated horseradish root. If you don’t own a rotisserie set-up, don’t worry: You’re not “spit out of luck.” You have other options. Indirect Grilling/Smoking: Because of its thickness, prime rib is a good candidate for indirect grilling or smoking. (On a charcoal grill, pile lit embers on opposite sides of the grill with a drip pan between them, then place the roast directly on the grill grate over the drip pan.) Add wood chunks or soaked wood chips as needed. On a gas grill, light the outside burners and place the meat between them. Arrange 1 or 2 wood chunks directly on the diffuser plates, add soaked wood chips to your dedicated smoker box, or wrap soaked wood chips in foil pouches, punch holes in the pouches, and place them over the lit burners. Here is a recipe to guide you. If you own a smoker, set it up according to the manufacturer’s instructions and smoke the prime rib until the interior reaches 125 to 135 or your desired internal temperature. For something refreshingly different, try a variation first published in How to Grill, my Brazilian-inspired rib roast stuffed with spicy chorizo sausage, bell peppers, whole carrots, and Romano cheese with Ember-Roasted Salsa. Reverse-Searing: In a nutshell, you smoke or indirect grill thick cuts of beef and other meats to within a few degrees of your ultimate desired internal temperature, rest them, then sear at high heat. The result is meat that is uniformly pink across its diameter—cooked to temperature—with a beautifully crusted exterior. (Traditionally, meat is seared, then roasted, a technique that yields a “bulls-eye” effect, where a blood red-center is surrounded by concentric rings of pink, then grey, then brown meat.) This method works for all sizes of prime rib, from a modest 2-bone piece that will feed four, to a massive 7-bone piece that will feed up to 20. Here’s my simple 5-step blueprint for prime rib perfection. The method also works great on thick steaks or chops. Smoked/Grilled: Think of this as “deconstructed” prime rib. Deserving of the word “ultimate,” this magnificent steak debuted on Season 2 of my show Project Smoke. (The show’s corollary, Project Fire, will begin airing on American Public Television around Memorial Day.) 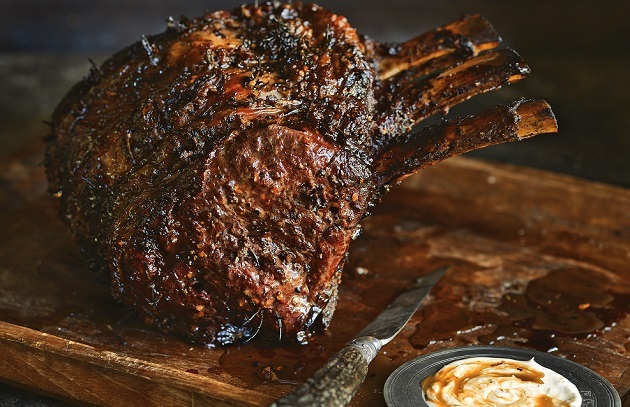 A kingly 7-bone prime rib is spit-roasted over a wood fire to an internal temperature of 110 degrees, then carved into thick steaks before being direct-grilled to order–again, over a wood fire. Your guests will be talking about this meal for years to come. 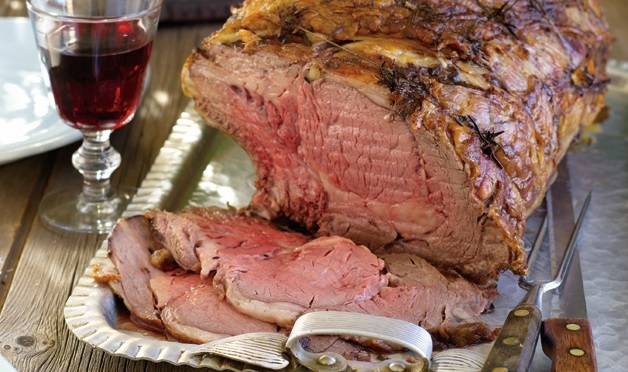 Try these prime rib recipes for yourself and tell us what you think on Facebook, Twitter, Instagram, or the Barbecue Board!